We honor the dedication of your tomb, O Word. On the thirteenth the Anastasis is made ready for dedication. On this day we celebrate the dedication of the glorious and great new temple of Jerusalem - not the one which King Solomon built on Mount Moriah [2 Chron. 3] but rather the one which the pious Emperor Constantine and his praiseworthy mother Helen wondrously built on Mount Golgotha after cleansing and renewing that holy place which was once defiled by impious idolatry. After the voluntary Passion of Christ and His Resurrection and Ascension into heaven, the holy passion where our salvation was wrought was scorned and profaned by the enemies of Christ, especially by the impious Emperor Hadrian, who defiled all the holy places with demonic idols and unclean sacrifices. He built a city named after himself called Aelia (his name being Aelius Hadrian) where the beautiful city of Jerusalem had once stood, and he commanded that the Lord's Sepulchre be covered with dirt and rubble. 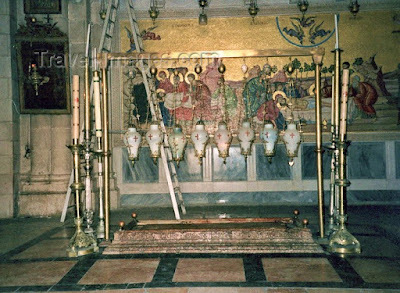 On the mount where Christ was crucified, he erected a temple to his vile goddess Venus, setting up her idol in it, and over the Grave of God he set an idol, the god Jupiter. And where the Lamb of God offered Himself in sacrifice to God the Father for our sins, defiled sacrifices were offered to the demons and filthy iniquities were committed. Likewise in Bethlehem, where the Most Pure One was born of a pure womb, an idol of Adonis was erected so that the holy place might be polluted by shameful deeds. 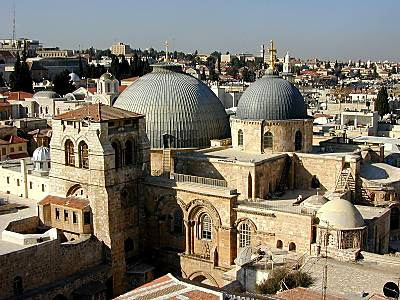 Where the Temple of Solomon had stood, a temple of the idols was built, and it was decreed that no one was to call that city Jerusalem, but instead, Aelia. All these things were done so that the remembrance of the name of Jesus Christ might vanish from the earth. 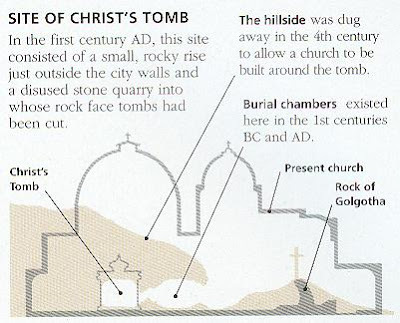 For this reason, the City where Christ worked many signs was renamed, and the places where He was born, crucified, and buried were made to be the dwelling-places of demons so that every nation would forget Christ and so that the places where Christ had walked would never serve to remind anyone of Him. However, the wretches who did these things themselves perished with a resounding noise, and the King of Glory again glorified the holy places. 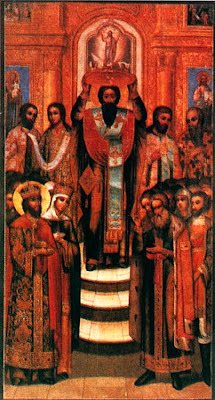 When He had elevated the Emperor Constantine and his mother Helen to the throne and had enlightened them with the light of the holy Orthodox Faith, the Lord placed in their hearts the desire to re-establish the holy city of Jerusalem, to found a beautiful temple of God at the place where the temple of Christ's body was destroyed and rebuilt after three days, and to cleanse all the holy places of the defilement of demons, consecrating them once more to God. 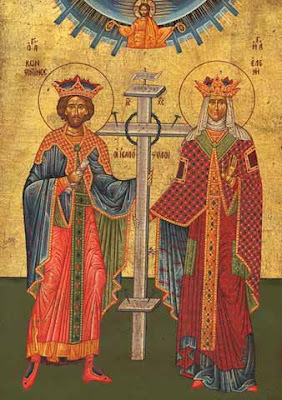 To this end, the pious Emperor Constantine sent his mother Helen with much gold to Jerusalem to carry out his intention, and he wrote to the holy Patriarch Macarius, instructing him to speed the construction of churches at the holy places. When Saint Helen arrived in Jerusalem, she destroyed all the temples of the idols and smashed the idols themselves. She cleansed the holy city of all impious defilement, altogether renewing it. She found the precious Cross and Tomb of the Lord, from which she had removed the dirt and stones with which they had been covered, and she erected a great church there which enclosed both of those places within a single structure. 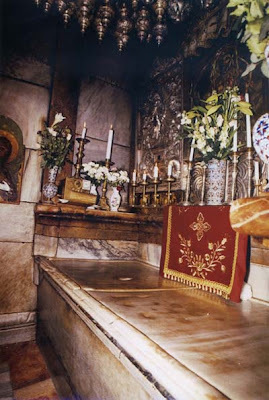 For the spot where Christ was crucified is not far from the place where He was buried, as Saint John says, "Now in the place where He was crucified, there was a garden; and in the garden a new sepulchre. There laid they Jesus therefore because of the Jews' preparation day; for the sepulchre was nigh at hand" [Jn. 19]. 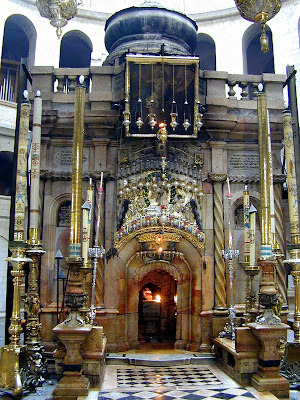 A single church encompassed Golgotha and the Sepulchre of the Lord, and that church was named The Martyrium, that is, The Testimony, for it bore witness to the Resurrection of Christ, inasmuch as Christ died and arose at that place [Cyril of Jerusalem, Catechetical Lecture 14]. 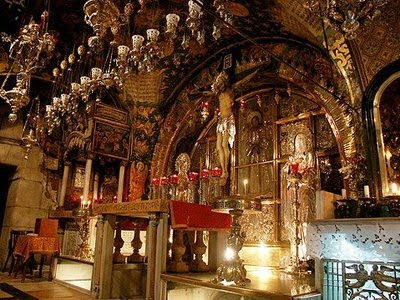 Saint Helen erected other churches: in Bethlehem, on the Mount of Olives, in Gethsemane, and at many other holy places, adorning them with every embellishment. Notwithstanding, the church which stood over the Grave of the Lord was the greatest and most beautiful of all. But the Empress Helen herself did not see its completion, for she returned to her son and reposed in the Lord before it was finished. It was not possible that such a wondrous and immense building should be completed within a short time: the church required almost ten years for its construction. When it was completed, the pious Emperor summoned bishops from every land to consecrate it. 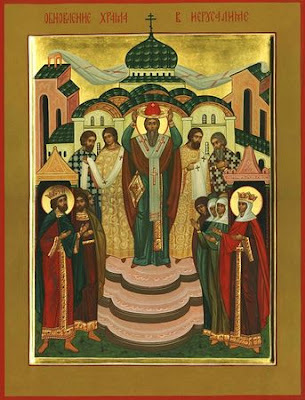 Thus a multitude of hierarchs came from Bithynia and Thrace, from Cilicia and Cappadocia, Syria and Mesopotamia, Phoenicia, Arabia, and Palestine; from Egypt and Africa, and from the Thebaid; and a single bishop arrived from Persia. Moreover, an innumerable multitude of people from throughout the world gathered together, such as could not be accommodated within Jerusalem. Thus the Temple of the Resurrection was consecrated on the thirteenth day of this month [September], and all Jerusalem was renewed in that thirtieth year of Constantine's reign [335 AD]. 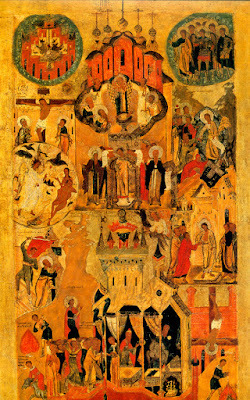 The holy fathers who had assembled there ordained, as had Solomon, that the day of the consecration be kept as a feast. 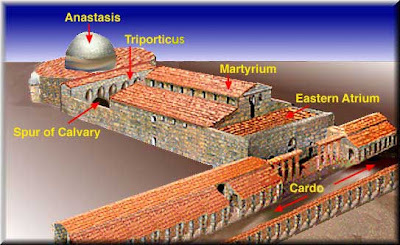 In the Old Testament, when he had completed the building of the Holy Holies of the most glorious temple, Solomon ordained that each September, the month in which it was consecrated, a feast should be kept (concerning which the Gospel says, "It was at Jerusalem the feast of the Dedication" [Jn. 10]). So, too, the holy Emperor and equal-to-the-apostles Constantine, having erected, as it were, a second Holy of Holies during this present era of the New Grace, ordained together with the holy fathers that the dedication of the great Church of Jerusalem, which is the mother of all churches, be celebrated in all the churches throughout the whole world. Let us, therefore, celebrate this feast, rendering thanks to Christ God, Who by His Passion and Resurrection has renewed all creation and cleansed His holy Church from idolatrous defilement. Let us ourselves be renewed, and let us lay aside the sin which besets us. let us do good works, walking in newness of life, so that as men celebrate the feast of the dedication of the temple made by human hands, the angels may celebrate the renewal of the temple of our soul, not made by the hands of man. For there is joy in heaven among the angels over one sinner who is renewed by repentance. Thou hast shown the earthly beauty of the holy tabernacle of Thy glory to be like unto the splendour of the heavenly firmament, O Lord. Strengthen it for ever and ever, and accept our prayers which we unceasingly offer therein unto Thee, through the Theotokos, O Thou Who art the Life and Resurrection of all. The Church is shown to be a many-lighted heaven that doth shine a guiding light upon all them that do believe; wherein while standing we cry aloud: Do Thou Thyself now establish this house, O Lord.